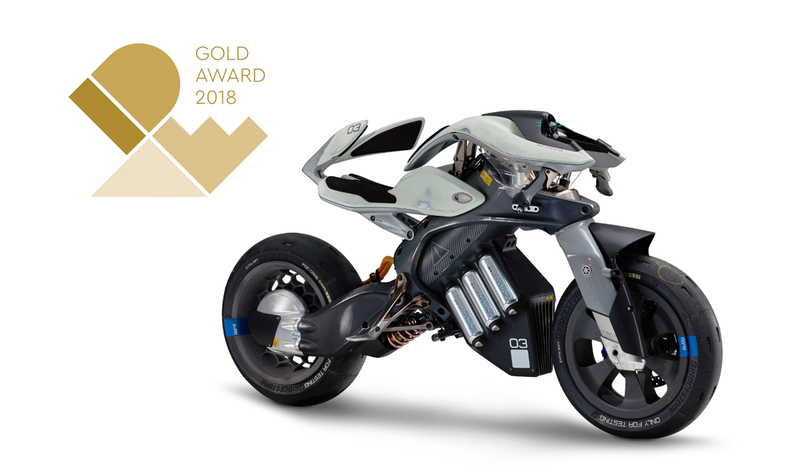 Yamaha Motor's First Grand Gold Prize at IDEA, Global Top Three Design Award, MOTOROiD's Second Honor After Red Dot Award - News Releases | Yamaha Motor Co., Ltd.
IWATA, September 20, 2018—Yamaha Motor Co., Ltd. announced today that its MOTOROiD has received the ultimate "Gold" honor at the International Design Excellence Awards (IDEA) competition in the U.S., one of the most prestigious global design awards. The MOTOROiD concept model attracted much attention when exhibited at the likes of the 45th Tokyo Motor Show 2017 and CES(Consumer Electronics Show)2018. This selection represents Yamaha Motor's first-ever IDEA Gold award. The 2018 IDEA awards, the 38th running of the competition, attracted a record number of more than 1,870 entries from around the world. A total of 145 winners were honored across the Gold, Silver, and Bronze levels. This achievement marks the second design award received by the MOTOROiD, following on from the "Red Dot Award: Design Concept 2018" competition "Best of the Best" honor. The MOTOROiD concept model aims to demonstrate personal mobility in which the rider resonates harmoniously with the machine. Equipped with high-precision balance control via artificial intelligence and autonomous technology, the MOTOROiD can sense its own state and adjust its center of gravity accordingly to stand up off its kickstand and remain upright unassisted. It can also recognize its owner and move forward to meet him/her, as well as react based on its rider's actions thanks to its human-machine interface (HMI). These, among several other functions, allow MOTOROiD to behave like a true partner for its owner. MOTOROiD inspires a vision of future mobility that takes vehicles beyond simple "tools for movement." However, the exterior is deliberately far from flashy. The frame retains clear traces of the cuts made to create it, the body is marked with unvarnished scars here and there, and the tires are worn to the point that even the tread grooves are nearly gone. The designers and engineers wanted to show the public what their repeated creative clashes gave birth to in unaltered form. The MOTOROiD was created from scratch in order to embody the possibilities of technology and function. Hosted by the Industrial Designers Society of America, the IDEA Awards are one of the most prestigious global design competitions. Judging is conducted from various perspectives, such as innovativeness, user experience, and aesthetics, with designs of outstanding quality selected in a range of categories, such as Automotive & Transportation, Furniture & Lighting, Medical & Health, and Commercial & Industrial. The iF Design Award, the Red Dot Award, and the IDEA Awards are considered to be the global top three design competitions.